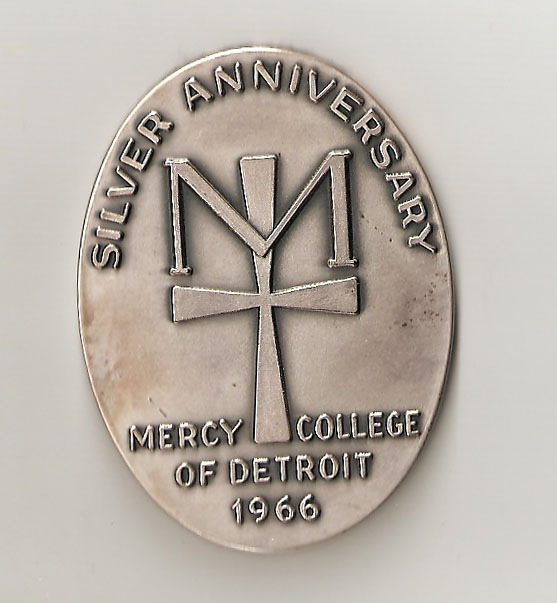 From 1980 to 1991 Mercy College of Detroit awarded Mercy Medallion to recognize and thank those honored for their service to the people of Detroit and Michigan through their own personal works of Mercy. Persons who receive the medallion eminently exemplify compassion for and commitment to their fellow human beings as they reach out to assist and improve the condition of humanity. The medallion is given to those who have significantly helped others or have influenced society’s response to a particular concern. 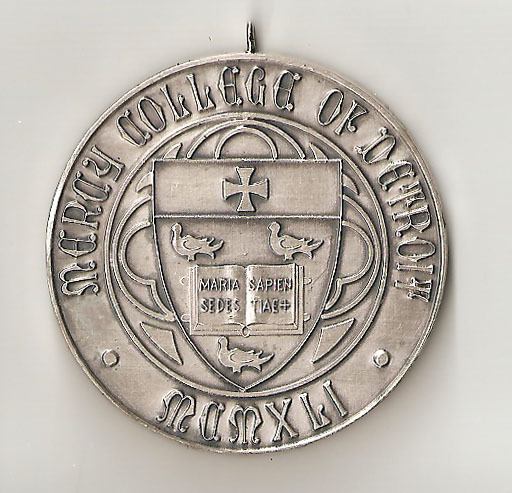 Some of the recipients of the medallion include: Douglas A. Fraser, Joseph L. Hudson, Jr., Honorable William G. Milliken, Marjorie Peebles-Meyers, M.D. Monsignor Clement H. Kern, Honorable Damon J. Keith, His Eminence John Cardinal Dearden, Honorable Richard H. Austin, Dave Bing, Alexa I. Canady and Thomas V. Angott. 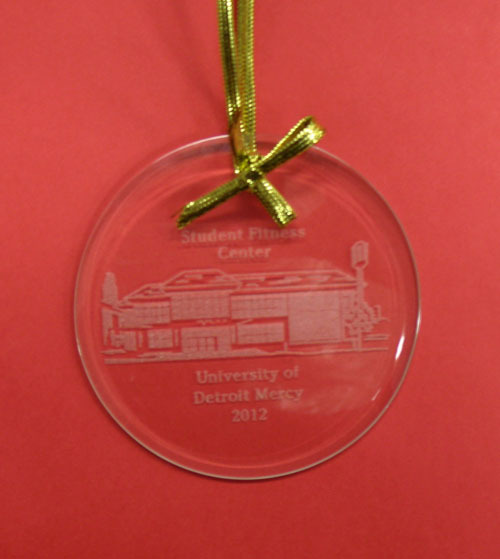 For additional recipients see the Special Collection page on University Honors Mercy Medallion. 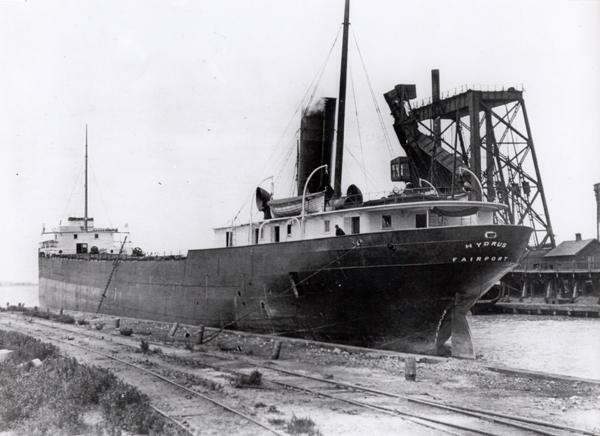 It was probably the worst maritime storm in the history of shipping that took place from November 7 through November 10, 1913 on the Great Lakes. 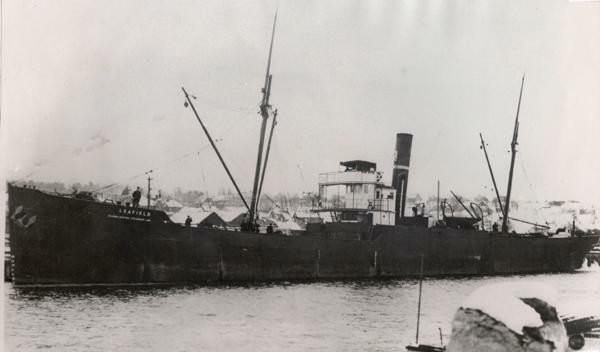 More than 250 men lost their lives, twelve ships sank and some of them have never been recovered. You have to remember that during this period of time the technology for weather forecasting was very limited-no satellites or radar systems had been invented yet. How much attention was paid to the weather predictions seemed to depend on the Captain’s experience and his own observation of weather conditions. In any case, no one then could have imagined how huge the storm would grow, its intensity and how long it would last. Although the term “hurricane” was considered to be a tropical storm term, this storm at its height would certainly be labeled as a hurricane with winds up to 60-70 miles per hour (these were land measurements – out on the great lakes they were probably much higher) with waves 35 feet high and lasted for about 16 hours. The city of Port Huron saw snow squalls create four to five feet snow drifts! 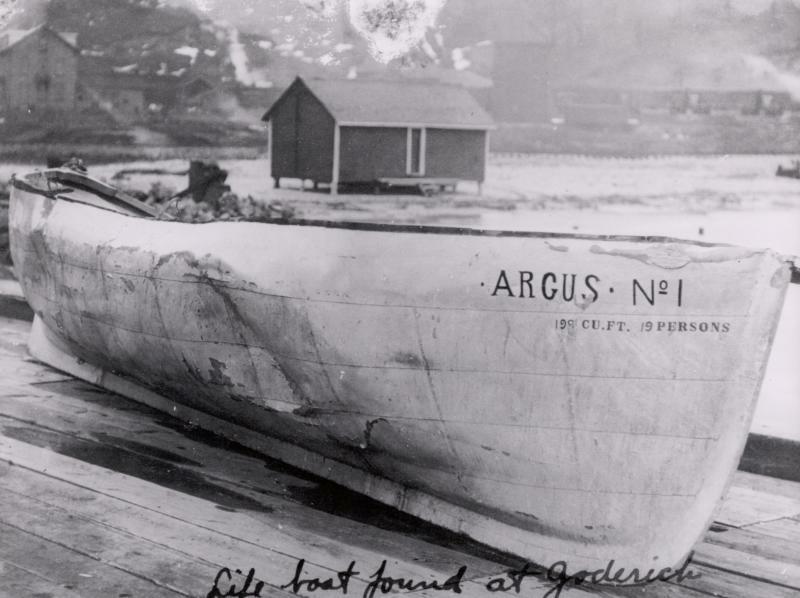 The greatest loss of life and ships took place on November 9th on Lake Huron: Argus-28 victims, James Carruthers-22 victims, Hydrus-25 victims, John A. McGean-28 victims, Charles S. Price-28 victims, Regina-20 victims, Issac M. Scott-28 victims, Wexford-20 victims. In the Marine Historical Collection at the University of Detroit Mercy Library, pictures and data on many of the ships affected by the storm can be found. 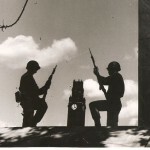 A sample of the pictures have been digitized for viewing on the library’s Special Collections page of Fr. Edward J. Dowling, S.J. 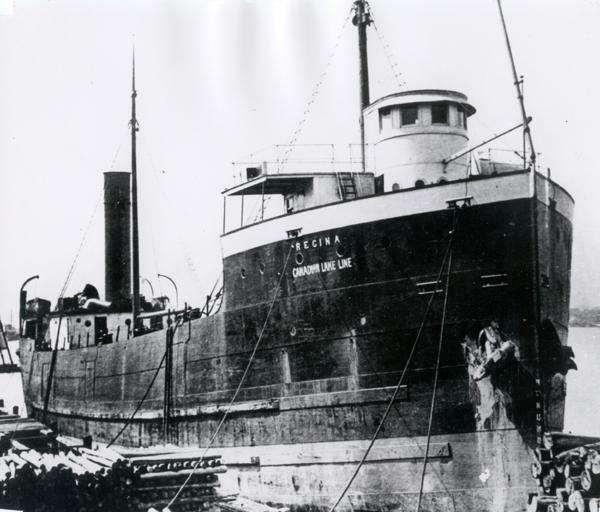 Marine Historical Collection. 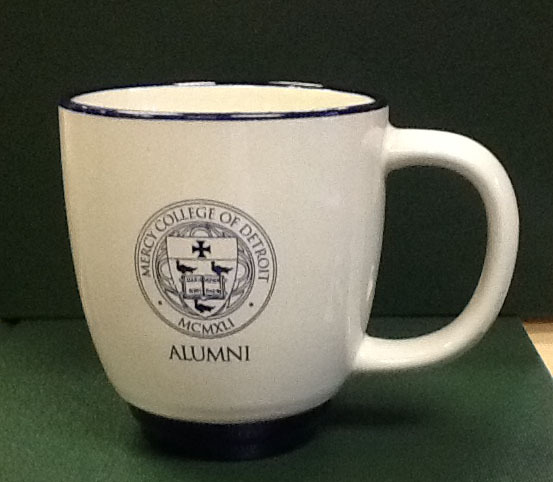 As the city of Detroit votes for its next Mayor, the University of Detroit Mercy is no stranger to having former students get elected into the position.The University of Detroit Law School produced three students who eventually succeeded in their run for the office. Don’t know what the odds could be, but it would be three mayoral administrations in a row; Miriani, 1957-1962, Cavanagh, 1962-1970, and Gribbs, 1970-1974. Louis C. Miriani graduated from University of Detroit Law School in 1922. I can’t find a class picture of him because the university did not have a yearbook until 1923, and they did not have a class picture of graduating students that I can find in the Varsity News for 1922. Miriani initially came into the mayor’s office upon the death of Mayor Albert Cobo in 1957, but did win the position on his own in the city election that same year. Miriani tried for another term as mayor, but was defeated by Jerome P. Cavanagh. 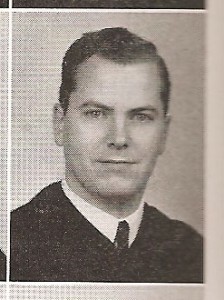 Cavanagh had two degrees from the University of Detroit, Bachelor of Philosophy from the College of Arts and Sciences in 1950 and a law degree from the Law School in 1954. It was a pretty close race, according to the Varsity News, with the Varsity News being the only city newspaper to predict that Cavanagh would win the election. He was very popular in his first year as mayor, and easily won re-election in 1965. His second term did not go as well when the city had to call in the National Guard to quell a riot which started when the police raided a blind pig in 1967. He decided not to run for re-election in 1969. 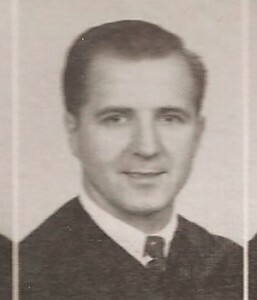 Roman S. Gribbs won election for mayor in 1970. He also had two degrees from the University of Detroit, Bachelor of Science in Economics and Business from the College of Commerce and Finance in 1952 and a law degree from the Law School in 1954 (the same class year as Cavanagh!). 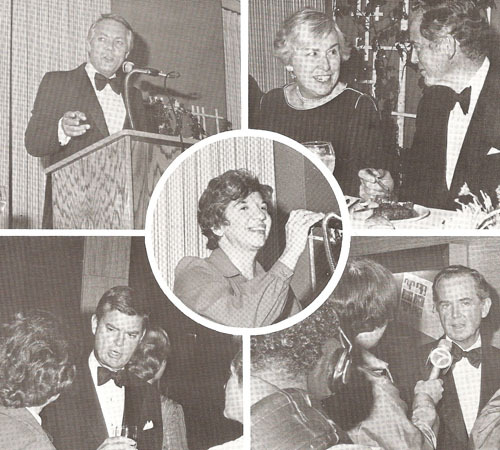 As a student, Gribbs was very active in the university: president of the Student Council, member of the Governor (G. Mennen) William’s Michigan Youth Commission, vice-president of Alpha Sigma Nu and a member of Blue Key, a national honor society. He declined to seek re-election in 1973 and as of this year,2013, was the last white person to hold the office of Mayor in the City of Detroit. This year, as another race for mayor take place, there is another UDMercy alumni in the running, Benny Napoleon. 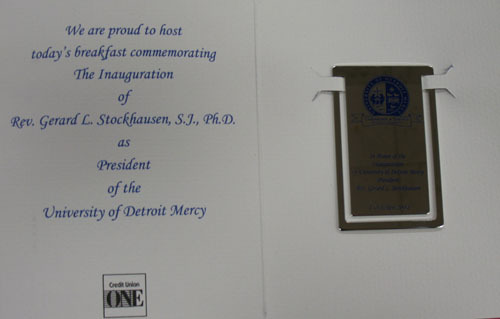 Napoleon graduated from Mercy College of Detroit (which consolidated with the University of Detroit) with an Associate of Arts and a Bachelor of Arts in 1982. 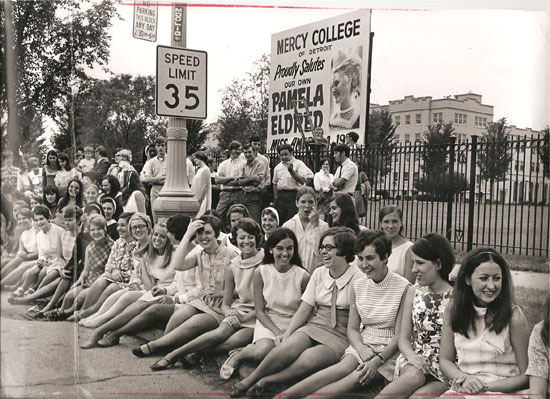 (Don’t know how that works out, but it was possible to get those two degrees at the same time at Mercy College.) I was a librarian at Mercy College and remember seeing Benny come in to use the library quite often. 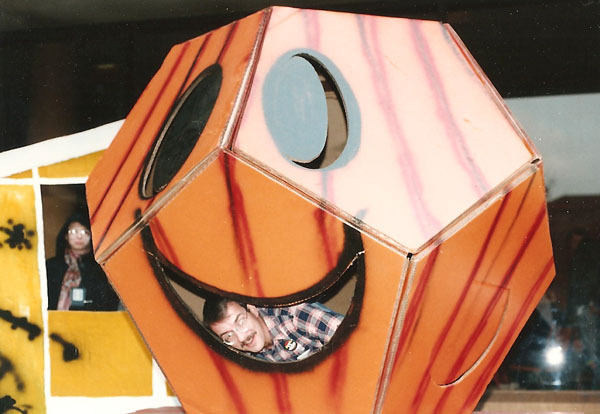 He always seemed to have a smile on his face whenever I saw him. I do not have a vote in this election, so all I can do is wish him well in whatever the future holds for him. 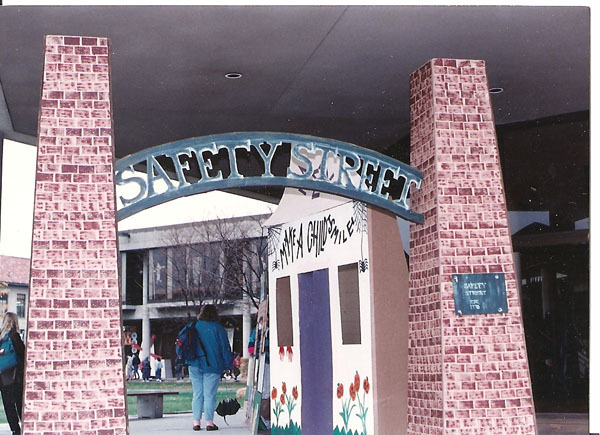 Safety Street was started by the School of Architecture back in 1990. 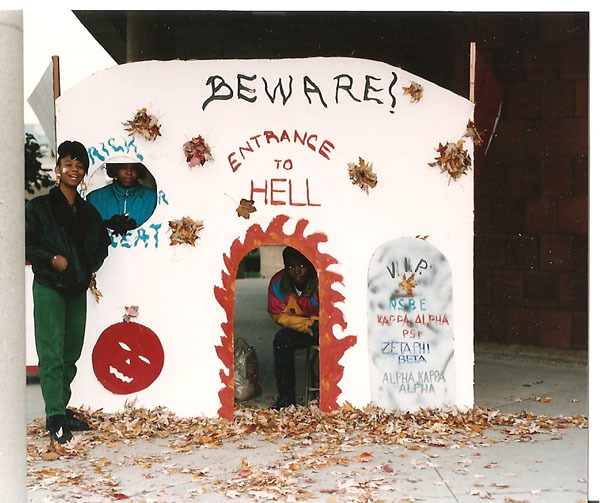 It grew to become a tradition for the entire campus with various sororities, fraternities, student organizations and university’s departments providing the booths, candy and activities such a face painting for neighborhood children. Hundreds of neighborhood children and their families have attended this free event. Here are a few pictures from past Safety Street activities. 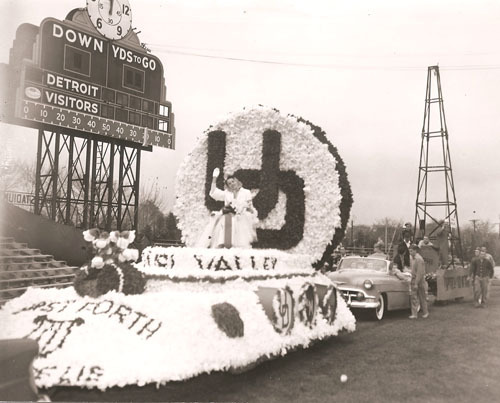 Back in the days when the University of Detroit had a football team, Homecoming of 1953 had all the traditional activities: pep rally, parade floats, homecoming queen, bonfires, and a dance before and after the game. 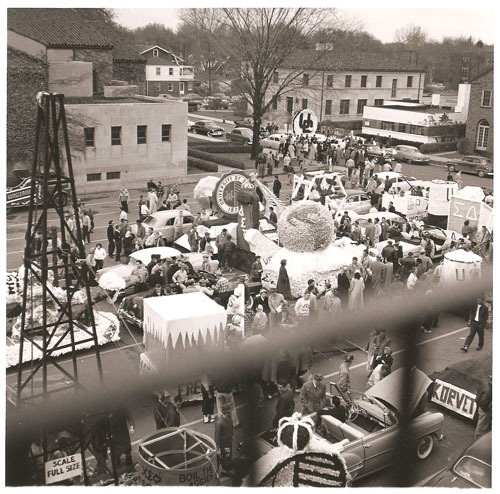 Homecoming festivities would start on Friday with a dance at the Memorial Building (now called Calihan Hall) when the homecoming queen would be crowned. 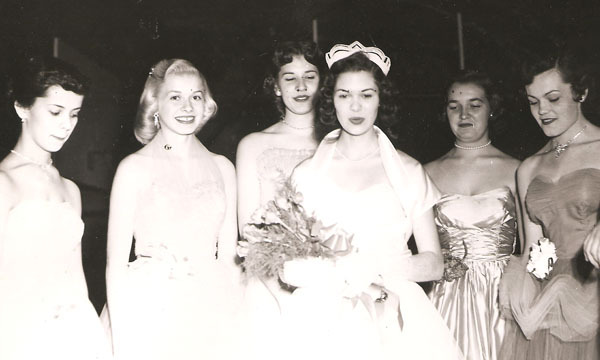 In 1953 D’Anne Howell, a dental hygienist student, was chosen as queen and her five court attendants were Mary Carlson, Marge Doherty, Fran Kollar, Carol LeDuc and Beverly White. 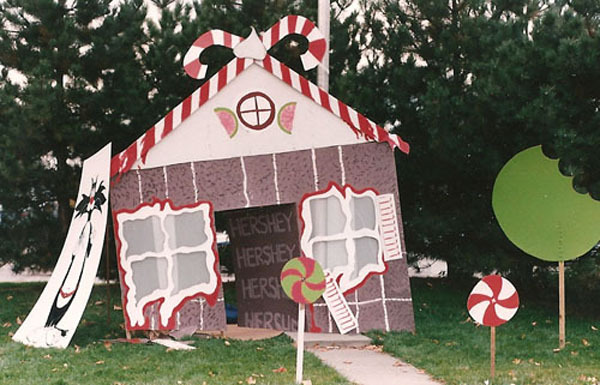 On Saturday around 2:00, the floats would start assembling in the Gesu parking lot where they would be judged. The parade would begin about 3:00 with a tour around the campus area (according to the map in the Varsity News it would go from Six Mile to Fairfield, to Puritan to Livernois where it would turn into the campus and into the stadium). 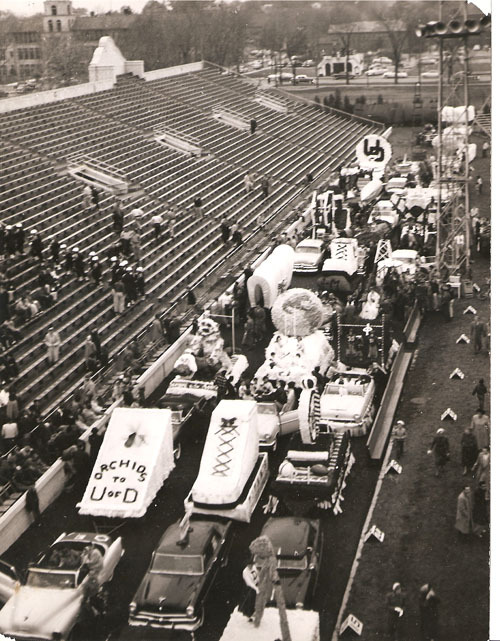 At the stadium there was a pep rally and a bonfire in which in 1953 the wood came from brittle dry lumber from buildings that were demolished because they were in the path of the Lodge expressway that was being built. 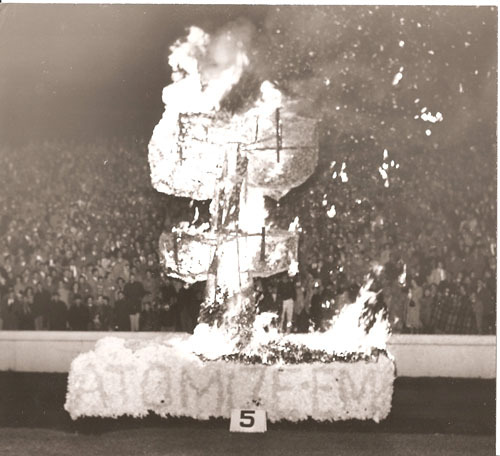 The homecoming queen, from a safe distance, ignited from a torch the gasoline-soaked pile to symbolize the conquest of the visiting team, in this case the Aggies of Oklahoma. Game time began at 8:15 p.m. against Oklahoma A & M. At half-time the top three floats picked as “best in the parade” and the queen and her court were honored. During the half-time parade one of the floats depicting a giant atomic bomb mushroom cloud which had been pouring smoke from the top, suddenly burst into flames. 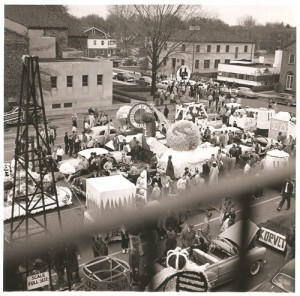 The student inside safely scrambled out and the float was unhitched from the car and rolled into the end zone, where the two teams lined up to start the second half. No one was injured. UD squeezed out a victory with a score of 18-14. They went on to win the season’s co-championship of the Missouri Valley Conference (MVC) with of all teams – Oklahoma A & M.
After the game, they held a Hardtimes dance in the Memorial Building featuring the music of the University dance band under the direction of Robert J. Tipich with vocal accompaniment Margie Shields, Arts freshman and Bob White, Commerce freshman. Tickets cost .75 cents per person. As the Detroit Tigers prepare for the American League Division playoffs, I thought I would take a moment to reminisce about my favorite team-the 1968 Detroit Tigers. Things were much simpler back then, they didn’t have to go through this whole division playoffs system like they do now. At the end of the regular season it was just whoever was in first place in the American League vs. National League. I guess there was not as much emphasis on getting a national television audience because not all the games were played at night. I remember hurrying home from school (I was in grade school back then) to watch the game on TV, like these UD students in Shiple watching the final out of the game. 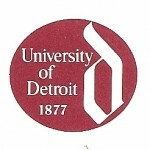 For many years, it seems that every branch of the university had their own logo. 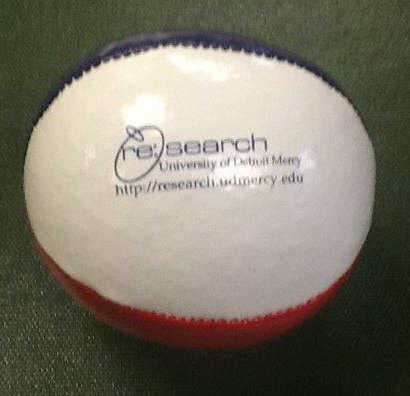 In October of 1968, they unveiled a new logo to give the university a single identification tag. 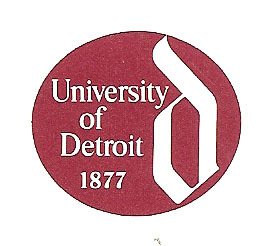 The ‘new’ logo would be an oval containing “University of Detroit” with a lower case “d”. The UD Theatre group moved into its new permanent (well at that time it was) home in a converted lecture hall in the Ford Life Sciences Building. 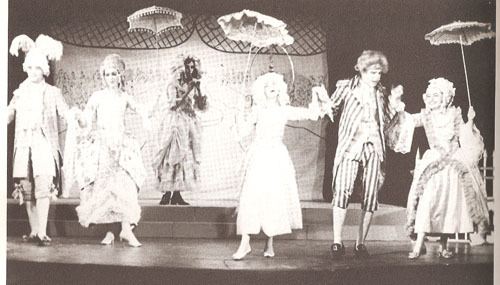 For years the theatre group had to perform in libraries, converted classrooms and gymnasiums. The season would open in September with an evening of one-acts “Zoo Story” by Edward Albee and “The Ridiculous Young Ladies” by Moliere. 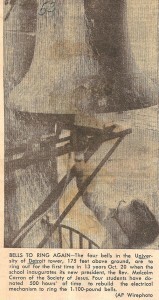 A UD chapter of of SDS (Student for a Democratic Society) was formed. 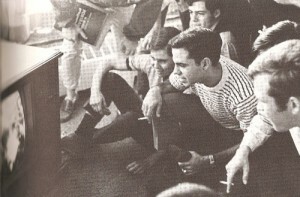 For those too young to know, the SDS was a national group of mostly college students who were considered by some to be a very radical organization that would stage protests against the establishment (primarily US government institutions). Duke Ellington presented his “Concert of Sacred Music” as one of the performances in the Town and Gown concert series. For this performance he included the U.D. Chorus under the direction of Don Large. The concert, using Freedom as its theme, included a medley of freedom songs and a musical adaptation of Frost’s “The Gift Outright” which was performed when Robert Frost visited U of D a few years earlier. So while the city of Detroit may have been focused on the Detroit Tigers, life on campus I guess you could say was business as usual. The 1968 Tigers were a welcomed relief from the previous summer of 1967, when Detroit endured a much publicized race riot with images of the National Guard on duty. This year a winning team might help get people to overlook the publicity of the city going through bankruptcy. It had been 23 years since the last time the Tigers had won a pennant and it would be another 16 years before they would win another championship in 1984. We are way overdue for another World Series championship! 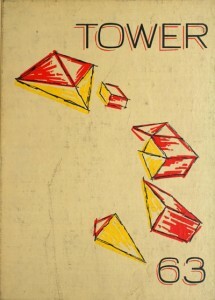 Take a look at the first picture of the tower and compare it to the second. Notice anything? (Aside from the fact that it needed a good cleaning!) The tower built in 1927 to cover up a smoke stack of the central heating plant for the university, was dedicated as a memorial to former students who gave their lives during World War I. 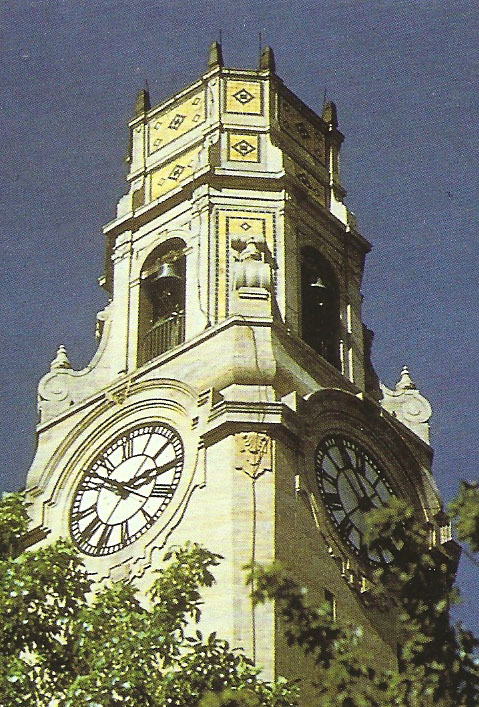 Since the clocks were installed, they never did work well, all four clocks would have different times and at some point stopped all together. 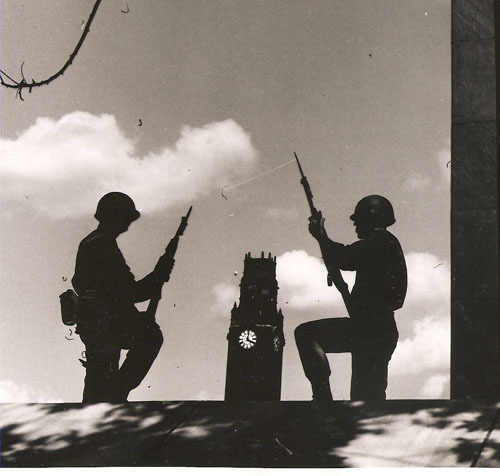 While undergoing repair, they took the hands off the clocks. 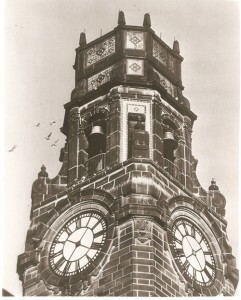 The most interesting part about the repair of the tower clocks is that it was done as a personal gift by a few students of the university. 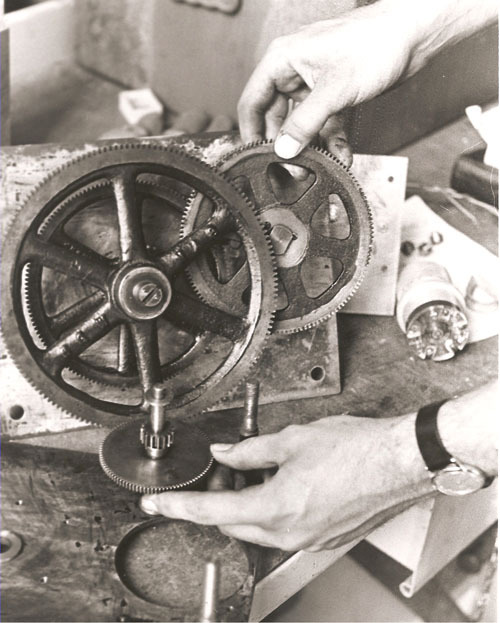 Thomas Toenjes, a senior in electrical engineering, along with his associates, Edward Sailer, Peter Kay, and Leo Moore, spent months of their own time getting no money or class credit working on repairing the clocks. 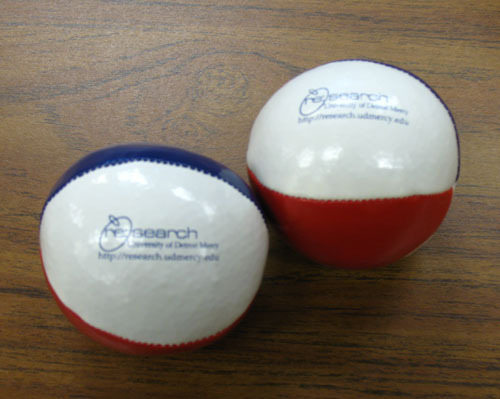 The university paid for the material they used which came to about $800. The university had gotten estimates to repair the clocks of $10,000-$25,000. 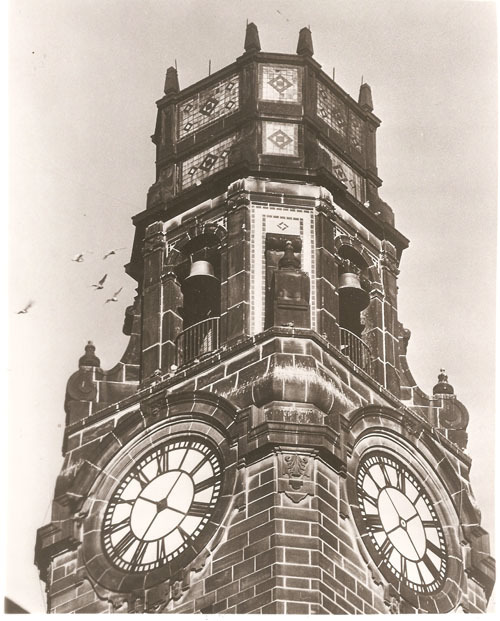 After having the correct time only twice a day for some 12 years, the clocks finally got running on time in 1965-but that’s not the end of the story. It still had no bells, which leads to another interesting story. One quiet night in 1953 the bells started to strike twelve and went on, and on, and on, and on……The Rev. George Shiple, then superintendent of the grounds and buildings, got Clerical Jimmy Valentine, as the only man with keys that summer night, out of bed to turn them off. They did not ring again for another 13 years! Paul Bricker, a graduate student in physics along with fellow ham radio enthusiasts and members of the U-D Ham Club, John Augenstein, Mark Karney, Dennis Kramer and several machine shop technicians, put in 500 (free) hours along with $500 for equipment and material to get the bells ringing again. 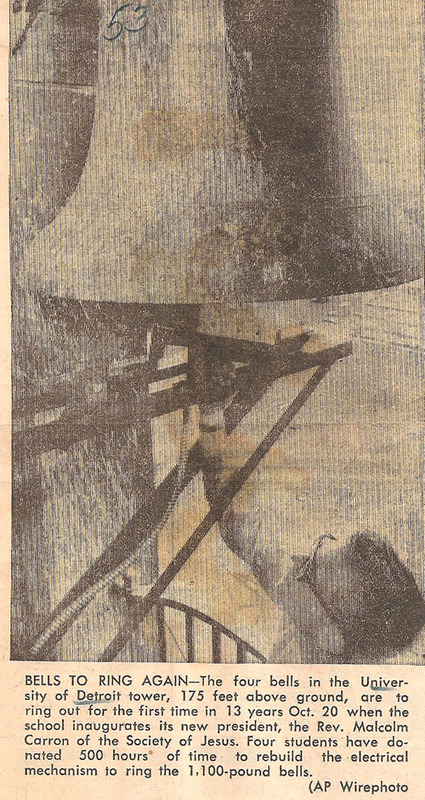 Each of the four bells weighs 1,100 lbs. and are all the same tone. On Oct. 20, 1966, when Rev. Malcolm Carron, S.J. 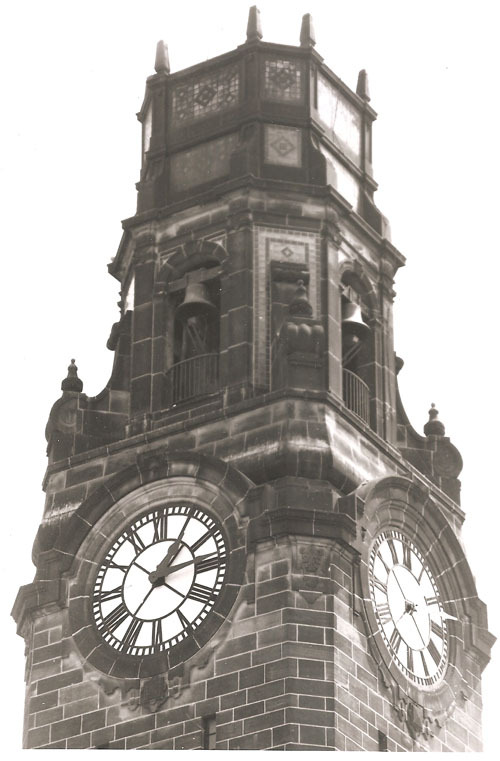 was inaugurated as the university’s new president, the bells were ringing again for the first time since they were silenced in 1953. On one more final note: for its 50th anniversary, the tower got a much needed bath. In 1977 a low pressure sand blasting process returned the tower to its original sandstone color. 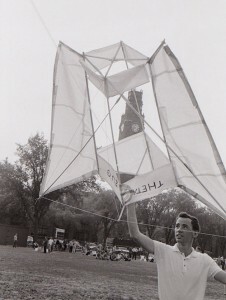 “Go fly a kite,” does not sound like an architectural project if you think architecture students just deals with buildings firmly stuck on the ground, but that was a final assignment from architecture instructors Robert Camblin and Jens Plum in 1963. Each student had to design and construct a scale model, taking into consideration various architectural components such as design, color, structure and function. 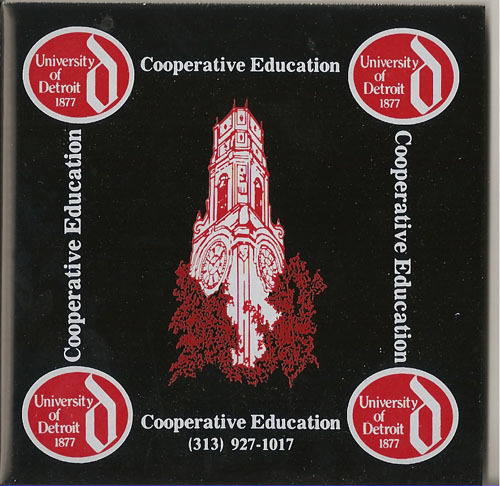 The class of ’63 was the first to graduate a class from U of D with a Bachelor of Architecture. 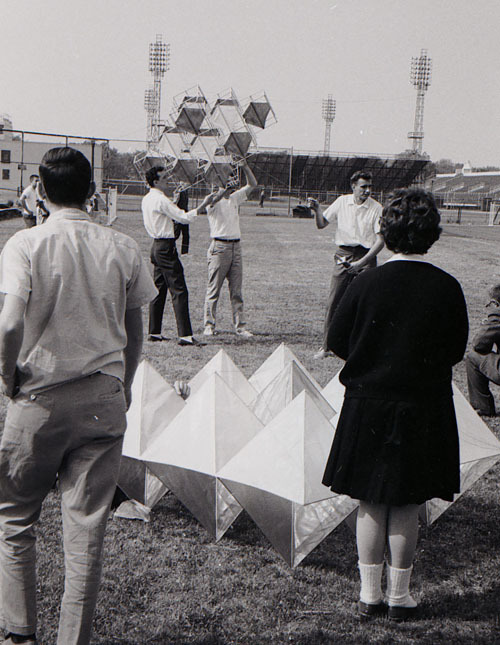 The architecture program had been in place since 1922 as part of the engineering program and up until 1957 it was referred to as a five-year program in architectural engineering. In 1965 the “Department of Architecture” was made School of Architecture with Bruno Leon named as the first dean of the new school. The School or Architecture is not just about buildings any more. It also includes Digital Media Studies (DMS), a unique program combining theory, design and technology. DMS is designed to prepare graduates for work in digital media fields such as graphic design, web authoring, branding, print, video and video game design. As the School of Architecture continues to evolve, I would say it is still flying as high as a kite! 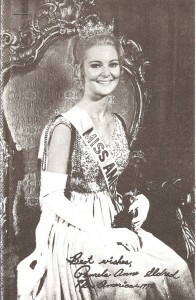 Pamela Eldred had a goal since she was in the third grade: Walking down the runway at the Miss America Pageant. Not only did she get to represent Michigan in the Miss America Pageant, she won the title of Miss America 1970. She was a senior at Mercy College with a major in speech and drama. In the talent portion of the pageant she performed a ballet for which she won the talent award. A brief account of her experience as Miss America (from the student newspaper): Each day would begin at 4:00 or 5:00 a.m. and start traveling to a scheduled appearance. 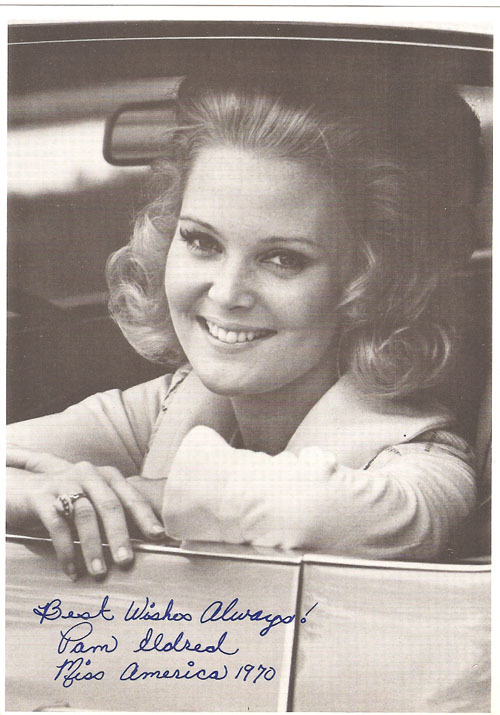 Pam’s program appearances consisted of making speeches, autographing sessions, modeling for stores and fashion shows, filming commercials and campaigning for charitable organizations. She traveled 350,000 miles in 47 states (a-w-w-w she didn’t get to make it to Hawaii during her reign) and even made a trip to Viet Nam where she entertained the troops with singing and dancing and visited many orphanages. After living out of a suitcase for a year, she decided against a career in stage and drama and do something where she could be close to family and friends. From doing a Google search on her name, it looks like she has settled on Michigan as home.